Police close to the Palace of Westminster, London, after sounds similar to gunfire have been heard close to the Palace of Westminster. Police outside the Palace of Westminster, London, after sounds similar to gunfire have been heard close to the Palace of Westminster. An Air Ambulance outside the Palace of Westminster, London, after sounds similar to gunfire have been heard close to the Palace of Westminster. Five people have been killed, including an armed police officer, in a major terrorist incident just yards from the Houses of Parliament this afternoon. Here's everything we know about the attack so far. Around 2:40pm, an attacker mowed down about a dozen pedestrians on London's Westminster Bridge in a grey Hyundai i40 leaving one woman dead and several others with "catastrophic injuries". The vehicle then crashed into railings just yards from the Houses of Parliament and the attacker was seen running through the gates of the Palace of Westminster with a knife. He reportedly stabbed a policeman before being shot by armed officers. Paramedics fought to save his life and that of his victim on the floor of the cobbled courtyard just yards from the House of Commons. Both the policeman are the attacker were later confirmed dead. Two large knives could be seen at the scene. Foreign Office minister Tobias Ellwood was among those who rushed to help. Mr Ellwood, who lost his brother in the Bali bombing, could be seen pumping the officer's chest then standing above him, his hands and face smeared with blood. How many casualties are there? 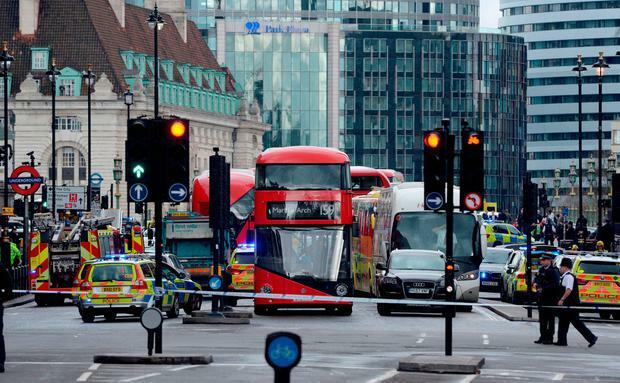 Five people are confirmed dead, including the attacker and the police officer who was stabbed, Scotland Yard's top anti-terror officer Mark Rowley has confirmed. The other three victims died after the car rampage on Westminster Bridge, including a female pedestrian who became trapped under the wheels of a bus after seemingly being flung there by the attacker's car, according to a junior doctor. At least 40 people have been seriously injured, including three police officers on their way back from a commendation ceremony. London Ambulance Service said 10 people were were treated at Westminster Bridge. Some people are believed to have "catastrophic" injuries. Three French teenagers on a school visit to London were among those injured at the bridge. The extent of their injuries is not yet known. Le Telegramme reported the students, aged between 15 and 16, were wounded in the attack with one ending up on the roof of the car. The pupils from a school in Concarneau, Brittany, had arrived in London on Sunday evening. Five South Koreans are among those injured in the London attack, it has been confirmed. Another woman who apparently jumped into the Thames as the attacker drove across the bridge was rescued and given urgent medical treatment on a nearby pier. No details are yet known, although eyewitnesses described seeing an Asian man in his 40s carrying a knife. London police say they believe there was only one attacker. Is it a terror attack? Scotland Yard has declared the attack a terrorist incident and said a counter-terrorism investigation is under way. Where is the Prime Minister? Prime Minister Theresa May was seen being ushered into a silver Jaguar in the grounds of the Palace of Westminster. A Downing Street source confirmed she was "OK". She is currently monitoring the situation from Downing Street and will chair a meeting of the Government's emergency Cobra committee later. Police are asking the public to avoid the following areas this evening: Parliament Square, Whitehall, Westminster Bridge, Lambeth Bridge, Victoria Street up to the junction with Broadway and Victoria Embankment up to Embankment Tube station. Officers also want anyone with images or film of the incident to hand those to the police. The area around Westminster is currently on lock down and the public are being urged to avoid the area and remain vigilant. Extra armed police are being deployed across the capital. Facebook has activated its Safety Check feature. People in the area can use the tool to mark themselves as "safe" which will be visible to their friends on the network, as well as to see if friends nearby have done the same.